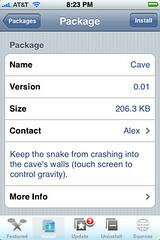 Developer’s description of app: Keep the snake from crashing into the cave’s walls (touch screen to control gravity). 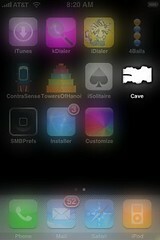 Cave is available in the Installer.app through the Ste Packaging source. This game is actually based on touch! It is a little tricky at first but, once you get used to it…it is doable. 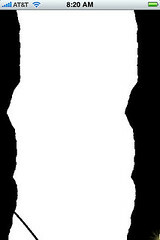 The snake is automatically pulled to the left…so, to keep it from running into the left wall…you need to touch the screen which makes the snake turn right. But, you have to stop touching the screen in time that the snake doesn’t run into the right wall! I know…sounds difficult…and it is…but, it is also slightly addicting. The only thing they need now is a Play Again or New Game button because right now you have to hit the Home button to go back to the SpringBoard and then reopen the app to play again. For updates to this app, see below in the Apple iPhone School’s Moo Articles section.